Since 1960, the Waipahu Community Association (WCA) has worked tremendously to help build a better community by enhancing the economic, social and cultural vitality and image of Waipahu. Some of our projects include the development and operations of the Waipahu Festival Marketplace, business educational classes, provide community resource workshops and more. 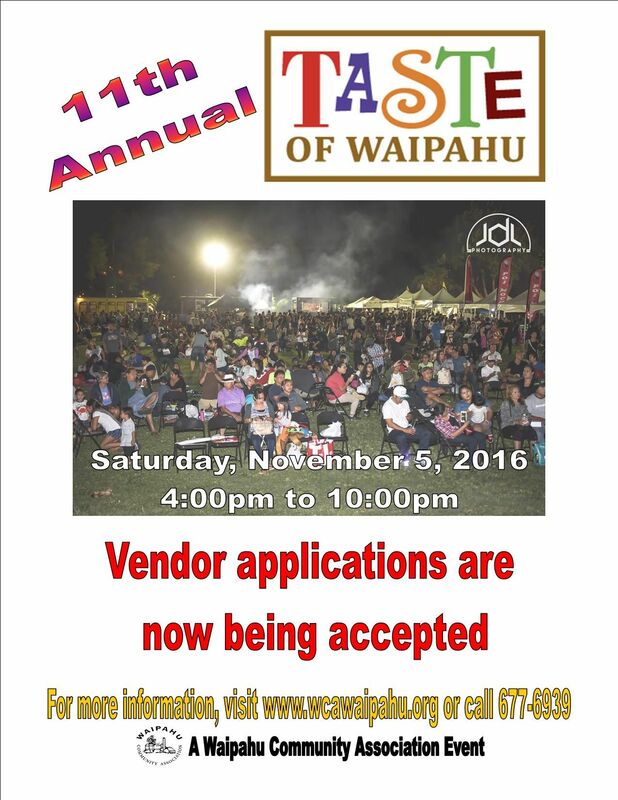 This year, the WCA will be hosting the 11th Annual Taste of Waipahu event. As you may know, this positive community event showcases the best of what Waipahu has to offer. This includes great food, building awareness of businesses in our area, and entertainment and fun for families. It will be held on Saturday, November 5, 2016 from 4:00 pm to 10:00 pm at the August Ahrens Elementary School campus. Last year’s event drew over 10,000 people! We need your kokua to ensure a successful event for our community. Thank you all for being an intricate service to community events that bring family, fun and laughter together. We are in search of food and product vendors that would like to participate in this year’s event. Booth spaces are confirmed on a first come, first served basis when payment in full is received.